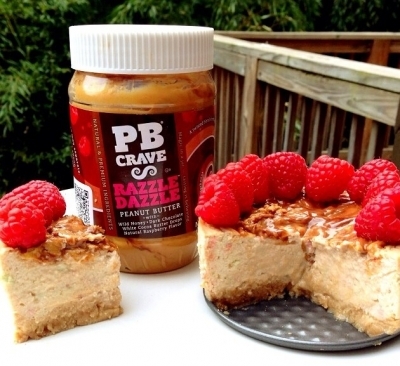 Delicious, fluffy and creamy cheesecake packed with protein. 1âƒ£Preheat oven to 320F. Combine ingredients for crust until a dough forms, divide into 2 batches and press down covering the entire bottom 2- 4 inch springform pans. 2âƒ£Blend the filling ingredients (I just did by hand) and pour over crust. Bake for 30-40 min until set but still a little jiggly in the middle. Allow to cool- then refrigerate or even freeze for later! âž¡ï¸âž¡ï¸Mine is topped with another 16g (1T) of Razzle Dazzle and 40g fresh raspberries.